Chevy's celebrating their 100th anniversary with the another special edition of their flagship sports car: the 2012 Chevrolet Centennial Edition Corvette. It'll add magnetic selective ride control, custom satin black wheels, and the most special special badging ever. Available on every Corvette model — from base C6 all the way up to ZR1 — the Centennial edition's a fitting way to remember racer-turned-founder Louis Chevrolet. In fact, Louie's ghostly mug appears all over the car. More fitting of his contemporary Henry Ford, you can have the Centennial edition in any color… so long as it's Carbon Flash Metallic (ahem, black). Every model gets Satin Black wheels with red calipers in an appropriate size, magnetic selective ride control, the image of Chevrolet himself (on the wheels, steering wheel, and B-pillars), and one fancy logo that replaces the Chevy fleur-de-lis with the numbers "100." 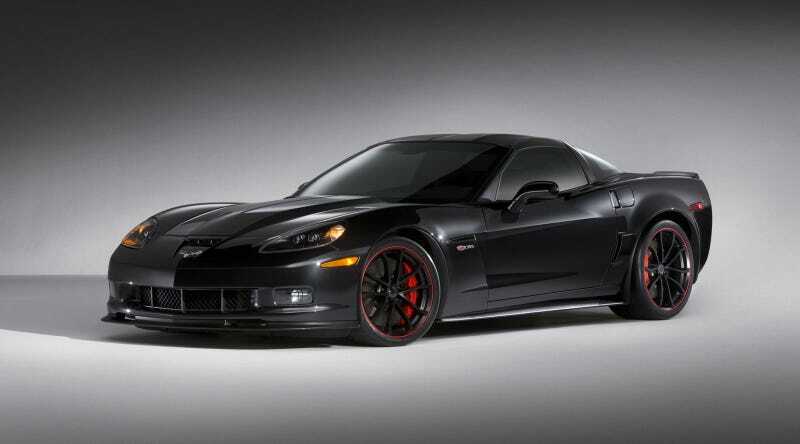 The first ZLC-code model is a Z06 and will go up for auction at Barrett-Jackson this year to benefit the Austin Hatcher Foundation for Pediatric Cancer where some buyer will pay good money for a great cause and get an evil-looking Chevrolet. At least they'll know it's real.